Scale has long been a bone of contention for this exactoid modeller. The world of diecast vehicles exists largely at railway scales - 00, H0, S - or larger - 1:43, 1:24, 1:18. Bearing in mind the multitude of 1:43 vehicles available, it never fails to amaze me how little there is by way of compatible-scale replicas of other types of transportation. So when Testors decides to include in its range not one, but three diecast helicopters at 1:43 scale, I’m more than interested. And interesting these helos are, especially the biggie of the three, a CH-149 Cormorant, which is the Canadian Armed Forces version of the Anglo-Italian AgustaWestland EW101. These big helos trundle regularly across the sky right in front of my hilltop office, near Oxford, UK. They are noisy beasts, with three engines that give out a throaty roar. Not that I mind of course, as having a ringside seat to watch hedge-hopper nap-of-the-earth training flights always gives me a big buzz. 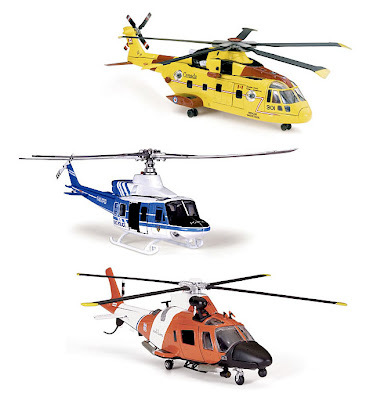 Testors’ other 1:43 helos are a US Coast Guard Agusta-Bell MH-68A and a Bell UH-1D in New York City Police colours. All are pre-painted, and assembly (the Cormorant has just 16 parts) is by screw-and-glue. A touch of subtle weathering and a light blowover with satin varnish will turn them from shiny toys to serious models without too much trouble - and of course, open the door to any number of diorama scenes. These helicopters are available from retail outlets or direct from Testors here.